Chamois hunting combines New Zealand’s natural back country beauty with our most beautiful game animal, the Alpine Chamois. At Lake Hawea Hunting Safaris chamois hunting is our third most popular hunt behind red stag and tahr. 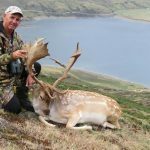 Chamois hunting is more difficult than red stag and tahr hunting, to secure a good trophy buck really is to secure a true prize. Generally chamois exist in low numbers, they are a graceful, nimble animal being a member of the antelope family, chamois also have incredible eyesight. The chamois is capable of electric speed and has an unpredictable nature making hunting a true challenge. We consider horns of 9 inches to be trophy size and we consistently take trophy chamois bucks up to and over 10 inches each season. Winter chamois hunting starts when the bucks start to join the nannies in late April. Chamois rut through May and into late June, at this time the bucks are in their jet black winter cape with a predominantly white face and a black stripe extending from the eye to the nose making for a striking appearance. Chamois hunting is best done during this rutting period; bucks are very active at this time and in some cases inquisitive and curious. Chamois also have a very nice summer cape which is a light brown to orange colour, still with the black face stripe and also a black dorsal stripe extending from the head to tail. In some cases hunters have taken winter chamois trophies and come back at a later date for a summer chamois hunt or vice versa. Being horned animals like tahr, chamois can be hunted all year round. 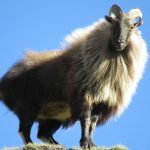 Consider a chamois hunt or a chamois and tahr combo with Lake Hawea Hunting Safaris your alpine hunting specialists.